Edinburgh City repeated the score line and the manner in which they won the previous match in January by romping into a 3 goal lead in 8 magical second half minutes before Annan staged a late comeback that could realistically have secured a point in a remarkable last 5 minutes. Disappointed Annan players leave the field. It was the same starting eleven for Annan which secured the points in the previous match against Stenhousemuir. There were no goals scored in the opening 45 minutes but there were some excellent openings created by both teams. Scott Shepherd came close to opening the scoring in the 6th minute when he drifted behind the Annan defence to finish with a fine shot which went narrowly past the post. Sinnamon finished a great run with a dangerous cross in the 25th minute and this was followed by a well worked Annan move down the right hand side ending with an inviting Omar cross. Craig Beattie headed narrowly past the post from a free kick for the visitors in the 24th minute. As the game approached half time Evan Horne finished a penetrating run only to be denied when his well struck shot was blocked. In an action packed second half which produced five goals it was Annan who started the second half on top. Henderson’s shot was blocked in the 51st minute and Aidan Smith should have done better in the 54th minute when Annan opened up the City defence with Smiths effort failing to hit the target. It was a crucial moment in the match as 3 minutes later City went ahead with a superbly hit David Shepherd shot from the corner of the 18 yard box which flew into the top corner of the net to give Mitchell no chance. Annan squandered a golden opportunity to square the match in the 60th minute when Blair Henderson threaded the ball into the path of Aidan Smith who smashed his shot straight into keeper Callum Antell. It proved to be a costly missed opportunity from Annan, as 3 minutes later City doubled their lead. Watson conceded a free kick on the edge of the box and Tena’s well struck free kick took a wicked deflection off Annan’s man of the match Scott Hooper to give Mitchell no chance. City’s Golden spell continued and 2 minutes later Craig Beattie headed a corner kick into the net from close range to give the visitors what looked like an unassailable 3 goal advantage. Annan brought on substitutes Connor O’Keefe and Ben Armour and the introduction of these players gave Annan the desired lift with both players staking a claim for a starting position in the forthcoming mid week match against Montrose. In the 74th minute the referee waived aside claims for a penalty from Annan from an O’Keefe’s cross. Annan finally made the breakthrough in the 85th minute from a well constructed move down the right, O’Keefe connecting with Horne’s cut back cross from 8 yards to send a low shot into the corner of the net. 2 minutes later Annan won a penalty after Scott Roberts was fouled and Henderson converted the spot kick to set up a grand stand finish from the home team who almost grabbed a sensational equaliser when Watsons close range shot was deflected over the bar. The defeat leaves Annan’s chances of a play off spot very difficult to achieve and the victory for City goes a long way to securing their SPFL2 status. 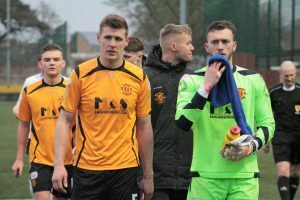 ANNAN ATHLETIC – Alex Mitchell, Scott Hooper, James Creaney, James Henry (Scott Roberts 61 min), Peter Watson, Owen Moxon ( Connor O’Keefe 70 min) Evan Horne, Ryan Sinnamon , Aidan Smith ( Ben Armour 67 min) , Blair Henderson, Rabin Omar. Substitutes not used Ayrton Sonkur, Jack Brannan, Cameron Salkeld, Steven Swinglehurst. EDINBURGH CITY – Callum Antell, Craig Thomson ( Christopher McKee 86 min) ,Jesus Garcia Tena, Craig Beattie, Gareth Rodger, John Dunn, Joshua Walker, Cameron Blues, Graham Taylor ( Kieran Watson 80 min), Scott David Shepherd, Farid El Alagui. Substitutes not used: Fraser Morton GK, Calum Hall, Luke Kennedy . Referee – Scott Miller Assistants – Paul O,Neill and Colin Whyte. Peterhead consolidated their position at the top of the table when they defeated the in form Stirling Albion one nil at Forthbank. Elgin City maintained their push for one of the play off positions with a convincing 3 goal victory over Berwick Rangers. Stenhousemuir’s play off hopes were dealt a blow after Clyde lifted the points with a 3-2 victory at Ochilview. Cowdenbeaths match against Montrose fell victim to the weather.